The suburb of Ainslie (2602) is just three kilometres from the central business district, yet it has that village feel and leafy streets which makes it an attractive suburb for young professionals. The nearest Corinna Dental practice to this suburb is our Brindabella Business Park practice (9 kilometres). Get to know a little bit more about Ainslie as we put it in the spotlight in this Corinna’s Canberra feature. In our Campbell suburb feature, we mentioned the history of the Duntroon Station and how Robert Campbell was influential in many ways in the area’s early history. The Campbell clan was Scottish and brought many other Scots to the district as workers. One of the workers was James Ainslie. Robert Campbell employed Ainslie to find a good grazing land for his 700 sheep. With the help of the local Indigenous people, Ainslie reached the Limestone Plains and became overseer of the flock. Over a decade, he managed to build up the numbers to 20,000. Soon after, he returned to Scotland where records show he got into trouble with the law and later on committed suicide (Source: Canberra Times). Sherbrooke Street is named after legislator Robert Lowe Sherbrooke, who procured the abolition of imprisonment for debt and the formation of a National Board of Education. 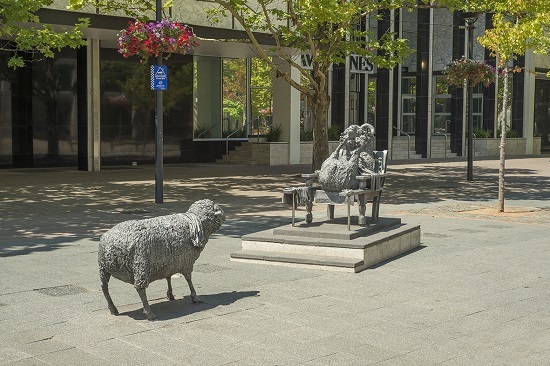 Ainslie being a mere three kilometres from the City centre has access to heaps of facilities, museums and shops— all within a five-minute drive or a quick bus ride. It is interesting to note that Ainslie School, which is one of the oldest schools in Canberra, is located in another suburb, Braddon. This is because the area we know as Braddon was formerly known as Ainslie, and the current suburb of Ainslie used to be known as North Ainslie. Ainslie has a fabulous shopping centre and restaurants including the European brasserie Pulp Kitchen and the very popular watering hole, Edgar’s Inn. For nature enthusiasts, there’s Mount Ainslie, which provides beautiful views after the 20-30 minutes it takes to climb to the top. The bushland in this area is a protected nature reserve, where local wildlife abounds. Of course, residents of Ainslie often don’t have to travel very far at all to see the wildlife: kangaroos are often seen on neighbourhood lawns and in local parks, and even bounding along Limestone Avenue in search of tasty morsels.